Henry Ware Clark of Newton, MA, Harvard College graduate, killed in action in 1918 in France. 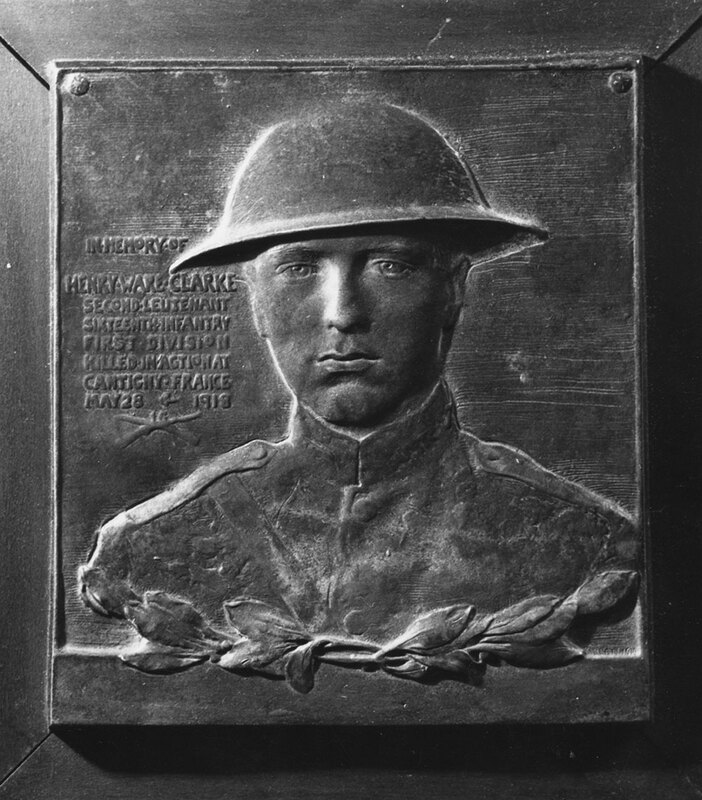 Portrait relief in bronze by F. W. Allen, Sculptor, 1919. Yearbook picture of Henry W. Clarke (1893-1918). Harvard graduate. Worked in Hudson, MA. He was buried at Bonvilliers, France and re-interred at Mt. Auburn Cemetery in Cambridge, MA on December 23, 1921. Official citation: HEADQUARTERS FIRST DIVISION General Orders No. 1. January 1, 1920. The Division Commander cites for gallantry in action and especially meritorious services 2d Lieutenant Henry W. Clarke, M>G> Co. 16th Inf. who was killed in action near Cantigny, France, May 28, 1918 by command of Major General Summerall. Allen was connected to Harvard College over the years. He made wax models for their medical lab, sculpted a portrait bust of Bay Meyer who rowed crew for Harvard in 1912 and was chosen to do the death masque and marble portrait of the beloved Harvard Dean Russell LeBaron Briggs. 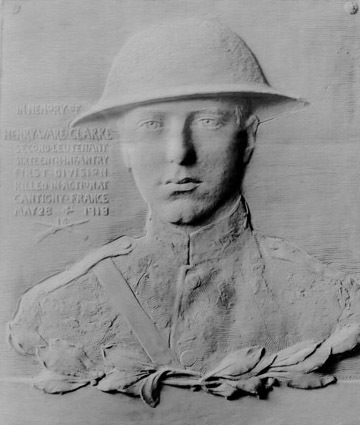 War hero Henry Ware Clarke, original bas-relief portrait in clay, by Frederick Warren Allen, Sculptor, 1919. This portrait of Harvard graduate Henry Ware Clark is a particularly fine example of Allen’s mastery of his craft and the difficult technique of modeling bas-relief (low-relief) sculpture. Dubbed as “painting in clay” by some, this two-dimensional art form must create likeness, texture and dimension in a carving that is sometimes only 1/8” deep. Sometimes carved into a block of clay or stone and sometimes built up on a flat ground in clay, the sculptor uses the play of light on the surface to create his effects. Like his predecessor Saint-Gaudens, the American sculptor famous for his innovative relief work, Allen here uses an inscription and symbols related to the character. The crossed guns of the 16th Infantry and the olive branches indicate his heroic status as a warrior for peace. Here also, the textured background and the rectangular frame with a thicker base were St.Gaudens’ style points. The Boston School of Artists and the Academy teachers in Paris by whom Allen was trained, espoused the classical academic training of the Beaux-Arts school style and the use of the bronze cast. Bronze allowed fine details to be reproduced and gave the artists more freedom to sculpt lively textures and realistic natural details. So, notice the striated background and the intricate shimmering texture of the officer’s dress coat contrasting with the smooth epaulettes at the shoulders and the flat strap across his chest. Note the details of the pins on his collar and the stitching down the front with the smooth round buttons. The olive branches are very realistic in their depth and the variation in the leaf form, providing dimension as they come out across the frame into the space of the viewer, seemingly placed there later on top of the portrait in tribute to the fallen hero. His large light eyes with the straight brow are outstanding and the shapely lips youthful and full. The cleft chin gives him strength of character with the high cheekbones and sturdy nose and his skin looks natural rather than air-brushed. The shadows are deep along the right side of the face, chin and nose and under the brim of the helmet, slightly and imperfectly tilted to one side, giving the whole portrait realism with great depth and color. Compositionally the portrait is balanced with the curve of the helmet’s brim mirroring the opposing curve of the olive branches. A solid oval formed by the contiguous line of the branches and epaulettes provides the sense of a secure base above which the nose is centered between the side borders of the simply-edged frame. The helmet echoes the larger, similar shape of the shoulders. Asymmetry is created with the angled front placket, the diagonal strap, the irregular fold on the right shoulder fabric, the tilt of the helmet’s brim and the leaf variations. The border is doubled at the top edge and decorated by corner tacks. The base is wide in comparison to provide stability and to accommodate the overhanging branches of olive leaves. The plaque is mounted on an undecorated mitered-corner dark wooden frame of equal width all around. Signed ALLEN 1919 at lower right above thick base in line with leaf border.